BHeC: Unhappy With Your Healthcare Provider? The Bermuda Health Council and Bernews have teamed-up to answer your questions about the island’s health care system. Visit www.bhec.bm to submit your queries and look for BHeC’s response on Bernews. Question: I am not happy with my healthcare provider. Who should I talk to? And are there any repercussions for bad health care on this Island? Answer: If you are not happy with your provider [health business], there are usually other options on the Island for your care. 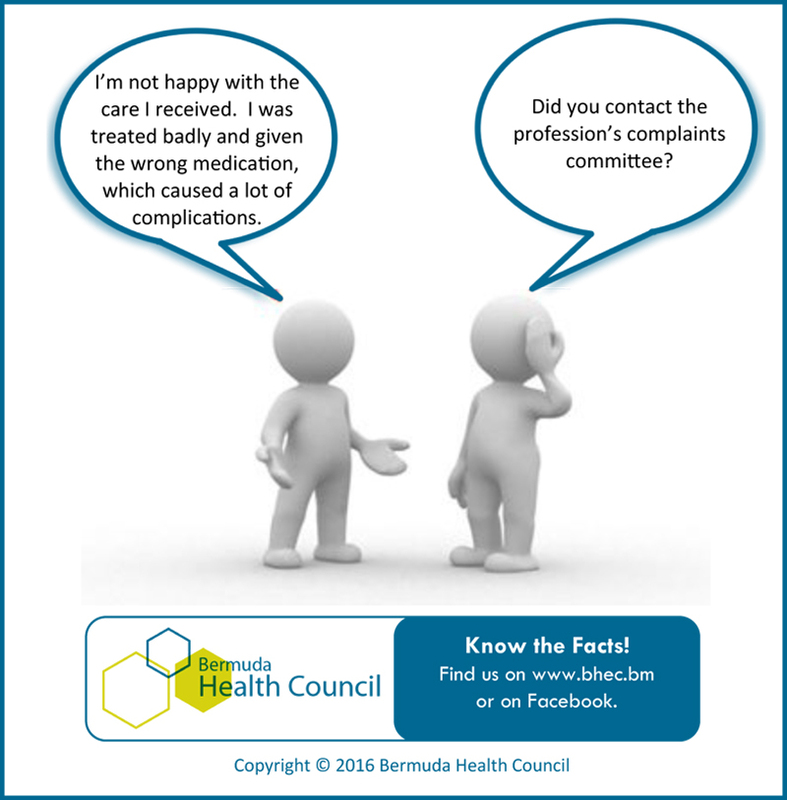 The Bermuda Health Council has an online directory where you can search for a different health provider or professional. If, however, you think the care you’ve been given is of serious clinical concern and depending on the health professional providing care, complaints should be reported to the relevant Statutory Body or Professional Association. Regulated health professionals which include physicians, nurses, allied health professionals, dentists, pharmacists, opticians and optometrists, and psychologists, must be registered with a local statutory body in order to practice in Bermuda. Statutory bodies by law have two key roles in ensuring good quality healthcare for Bermuda’s residents:  to verify that all registered professionals are appropriately trained to provide care and  investigate complaints and take disciplinary action where appropriate. Unregulated health professionals are not required to register with a statutory body but some groups have established professional associations. The associations are similar to statutory bodies; however, they do not have legislative authority. Many self-regulate and have developed registration criteria, complaints handling processes and disciplinary procedures. Complaints can also be made with the Health Council. While we are not directly involved in disciplining professionals, we track complaints and ensure they are appropriately handled by the relevant authorities. This relationship with professional bodies helps us to monitor the health system and identify areas of improvement in an effort to provide Bermuda’s residents with a quality, safe and effective health system. A summary of complaints made to statutory bodies can be found in the Health Council’s Statutory Boards Assessment Report. This report also provides an overview of the registration processes, board administration and Health Council observations and recommendations for system improvements. We, the patients, are NOT PROTECTED from a physician’s WRONGDOINGS. It comes rather late to Bermuda. Better late, than not at all!! About time indeed my last Doctor would have let me end up in a wheelchair ! Told me to stop going on the internet,lucky for me I kept on and knew I was right. Doctors only get a few pitiful hours on nutrition and how it affects all the bodies systems . Demand better health care they Work for you and don’t forget that! Does BHC has a list of doctors were patients/residents can write their reviews? i think it will help those who are currently seeking GP and those who would want to change their GP. Have to wonder how serous the Health Care Council are – when publicly it appears no mention is made of efforts to investigate Health Care costs and Health Insurance premiums – in particular how such are affected by Commissions and Referral fees that are exchanged between Doctors and Pharmacies.